Researchers have discovered that a number of genetic mutations are associated with an increased risk of developing heart disease, which is one reason why knowing your family history is an important part of building a personalized health and prevention strategy. If you have a father or brother who had a heart attack before age 55 or a mother or sister who had a heart attack before age 65, you may be at increased risk of developing heart disease. But you can take proactive steps to significantly lower your risk even if you do have the gene changes associated with increased risk of heart disease. For one of the study groups, 10-year heart disease risk dropped from 10.7% to 5.1%. The risk decreased from 4.6% to 2% for a female-only group of study participants. The participants whose risk dropped the most were those who started the study following none of the habits and then incorporated two or more behaviors. 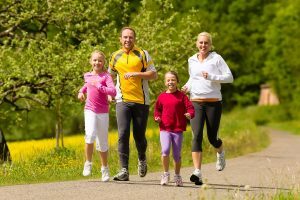 While everyone can benefit from leading a healthy lifestyle, that lifestyle becomes even more important if you have a family history of heart disease. Studies have found, however, that most people do not know their family health history. To gather yours so that your doctor can assess your risk factors for heart disease, start by finding out whether your grandparents, parents, and siblings have been diagnosed with heart disease or suffered a heart attack or stroke. If they have, find out what age they were when this occurred. Get screened for risk factors: Talk with your doctor to find out at what age you should begin screening for heart disease risk factors such as high blood pressure, cholesterol, and blood sugar based on your family and personal health history, and how often you should be screened. If you are diagnosed with any of these conditions, follow your doctor’s recommendations to manage them, which may include lifestyle changes and medications. Don’t smoke: Your doctor can recommend smoking cessation treatments to help you quit if you do smoke. Maintain a healthy weight: Changing what you eat and your activity level are the keys to gradual, healthy weight loss and weight maintenance. An evidence-based nutrition plan, rather than the latest diet trend, is a more effective approach to weight loss. Eat the right foods: A number of studies have linked regularly eating a Mediterranean diet with a lower risk of heart attack and stroke. One recent study found that adhering closely to this diet lowered the risk of heart attack, stroke, and death from heart disease by nearly 33%. Take part in regular exercise: While moderate exercise at least once a week does appear to lower heart disease risk, physicians recommend trying to get about 30 minutes of moderate exercising, such as walking, swimming, or biking, five days a week. Ask your doctor what exercises are the most appropriate for you based on your current fitness level and any health issues. Manage stress: Researchers have found an association between stress and anger and a trigger for heart attacks or angina in some people. There are a number of strategies that can help you manage stress, including working with a therapist or counselor, exercising, meditation and yoga, and having a strong and supportive social network. You can learn more about how family health history affects your health risks by downloading our Health Risk Management white paper. The paper includes information on the five pillars that should be included in your comprehensive health risk management plan and what steps you should take now to lower your risks.